This post is long and a bit technical. To make things easier, I’m going to start off with the conclusion for the people who don’t read the entire post. If you are traveling to another country and are planning to phone home on a smart phone using Skype in combination with a data roaming plan – I would suggest you reconsider. Skype is a bit of a data hog and your data charges will likely be higher than a reasonable long distance voice plan. Look into getting a long distance voice plan for your phone calls. Monitor your data usage during your trip – make sure that the monitor you are using is real time (unlike the one I was using). Another option which has been noted in the comments, is that you can change the SIM card in your phone and get much cheaper data rates that way. Rogers customers can unlock their phone for $50, but only if there phone is out of contract. Check with your carrier to see if this is an option for you. I recently spent a weekend in Chicago at a blogger conference. Before I left, I signed up for a U.S. data roaming plan from Rogers for my iPhone so that I could access the internet and not pay crazy roaming fees. The regular roaming data charge is about $30 per megabyte (MB) of data, which is pretty easy to use by reading about three or four web pages, so a data plan is a must if you plan to be surfing the net at all. The Rogers roaming data plan was $10 for one month plus $1 for every megabyte of data I used. This isn’t a great deal, but it’s a lot better than $30/MB of data used, which is what it costs without a data plan. You can read about my initial experience at How to avoid cell phone data roaming charges when traveling to the United States. We left our kids at home with my Mom and needed to call at least once a day to say hello. My plan was to use Skype to make these calls. I have a Skype long distance plan on my phone already, so there would be no extra charge for making long distance calls. I had estimated my data use at about 5 MB per day, based on my historical use and the fact that I wasn’t going to use the phone a lot while in Chicago. The Rogers website has a data transfer monitor which I kept an eye on while in Chicago. My data usage seemed to be pretty minimal and ended up being 10 MB for the whole trip which was a bit lower than what I predicted. I was pretty pleased with myself for taking the time to figure all this out and having a successful conclusion. But then I got the bill…. I was expecting to be charged about $10 for roaming data wireless use. In fact, the charge was $65.67! After checking the bill details, the pricing and charges seemed to be in order – it was only the excessive amount of data usage that was the problem. The amount didn’t jive with Roger’s online data monitor or my surfing time. It occurred to me that one difference from my normal iPhone web behaviour was the long distance Skype calls I had made. I suspected that this was the source of the extra data usage. A regular web page might use up a quarter or a third of an MB of data when it is loaded onto your phone – but there should be minimal or no data transfer going on while you read the page. I don’t know how much data is required for an internet voice call, but I suspect it is not a small amount and I do know that it is continuous, unlike reading web pages. I decided to give my friends at Rogers a call and see if they could help me understand what happened and how to avoid the excessive data charges in the future. Why did the online data monitor only show 10 MB of data used during the trip when it was actually 66 MB? Do Skype calls use more data and if so, how much? Because of past experience with bad reps, I have a rule that I always call Rogers at least twice. In this case, the first rep I talked to was completely useless, so I ended the call fairly quickly. The second rep was ok. He wasn’t the sharpest knife in the drawer, but he did say that he didn’t think the online data monitor was reliable while in the States. This is something that hadn’t occurred to me – I had assumed their online monitor was real time. I was then transferred to the tech department and talked to someone there who was very helpful. The tech guy confirmed that the online data monitor was a few days behind. This means it is ok for checking out your monthly data usage, but not for roaming data. It would be nice if Rogers could mention that fact on their website. The tech guy gave me a great tip on how to monitor your data usage, which you can use on an iPhone. I suspect other smart phones have a similar feature. The “Usage” screen indicates how much data you are sending sending and receiving in the Cellular Network Data Sent and Received lines. The numbers are in kilobytes or megabytes, so if you see “KB” after the number, divide by 1000 to get the approximate MBs used. Add both the Sent and Received values together to get the total. Tech guy said that this screen should be very accurate. What you can do before a trip is to reset the statistics (“Reset statistics” option is at the bottom of the page), which will zero out the data usage numbers. You can now monitor your usage on the trip quite accurately. This is what my phone usage screen looked like after a 5 minute Skype call. 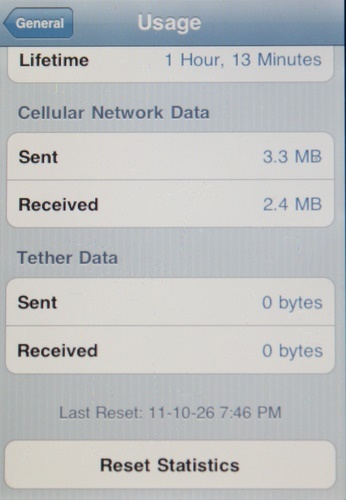 The “Send and Received” values under the “Cellular Network Data” were 3.3 MB + 2.4 MB = 5.7 MB. The “Reset Statistics” button is at the bottom. How much data does a Skype phone call use? None of the reps could shed any light on Skype call data rates, so I decided to do my own test. I reset the data stats on my phone and then made a few timed phone calls. The results confirmed my suspicion that the Skype phone calls are data hogs. The average data usage was 1.12 MB per minute which works out to $1.12 per minute. I thought I was being smart by using Skype for my long distance calls instead of using an expensive long distance voice plan, but in fact the Skype calls were costing me over $1 per minute, which is far more than any long distance plan. The other problem which I realized when I was writing this article is that in my mind, I wasn’t counting the Skype calls when estimating my data usage. Definitely a miscalculation. Now that I’m older and wiser in the ways of international data transfer charges, I have a new set of suggestions about how to reduce your roaming charges. Look at your regular data usage and estimate your usage while traveling. Try to consider differences in behaviour such as more long distance phone calls. Research available plans with your carrier for data, voice, and text messaging. Use WIFI wherever possible. Any internet usage (including Skype calls) will not cause any data transfer charges if you are connected to WIFI. Use a long distance voice plan for any phone calls back home. At Rogers I could have signed up for a plan which costs $5 for a month plus $0.10 per minute. This is less than one tenth the cost of using Skype. Even if you have a cheaper data plan, using a long distance voice plan will guarantee the per minute cost, which is not the case with Skype. If you want to make calls with the phone without internet – turn the roaming feature off. Monitor your data usage during your trip. My regular web surfing used more data than I thought. Try to limit use of the phone. Leave the phone at home (I’ll never, ever do this). How much data does regular surfing use? I wanted to verify that my normal surfing wasn’t using a lot of data. To do this I did several tests where I reset the data usage stats, surfed for a while and then checked the stats to find out how much data was used. Keep in mind that there are a lot of different variables which can affect data used for web surfing. Downloading videos and large files requires way more data transfer than a typical web page or email with no attachment. The tests confirmed that for my regular surfing which consists of reading newspaper articles, some emails, Google Reader, Twitter and Facebook – I was typically using about 0.34 MB per minute or about $0.34 per minute of surfing. This is more than I had expected, so while my main problem in Chicago was the Skype calls – my regular surfing also cost more than I thought it would. Even if the Skype calls used the same rate of data as the web surfing, it still would have been far more expensive than a long distance voice plan. Now I just have to remember all this stuff for the conference next year! Mike…you may want to look at the daily plan from T-Mobile where for $3/day you can get unlimited data. Pop in their SIM card and you’re away to the races. It’s a lot cheaper and capped at $3/day for unlimited use including Skype calls. For Rogers customers (I don’t know if other carriers have similar options) I suggest you look @ UMA. I was not aware that my cell phone had this option (company phone), but on a recent trip, when my wireless network was disabled, I kept receiving calls on my phone. After a while I realized that it was only when I was connected to wi-fi and on the wireless connection type (where you usually read GPRS, GSM, edge, etc.) it showed UMA. That is how I discover the service. It allows you to make calls and get text and email via the wi-fi connection. I’m not sure if it only works for Blackberry though. @Phil – I believe that I would have to get the phone unlocked in order to change the SIM card. I have to wait until the phone is off contract and then pay $50. Not an option at the moment. @Fernando – Thanks, I wasn’t aware of UMA. Ok, I added the SIM card tip to the article – thanks to all who suggested it. I use the app “Data Usage Pro” to track data usage on my iPhone– it tracks the data based on whether the source is the provider or wifi. This is a very helpful “real-time” way to monitor your data usage. I also use T-Mobile prepaid when I travel in the US. I have a Samsung phone from Bell that I unlocked on-line for $20– there is definitely no need to pay your cell provider a bloated fee for a service which can be found for much lower cost on the internet. I’ve purchased a SIM card from T-Mobile for two of our family’s unlocked phones. I’ve loaded each with $100 in minutes– cost works out to 10 cents per minute and minutes don’t expire for a year. Year is extended if you add a small amount in top-up. I’ve found it to be a great alternative to being gouged by the Canadian providers when I travel. Rogers may unlock most phones for $50 when out of contract but the my experience is that they are unable to unlock iphones and this is only possible through buying an unlocked phone at an apple store, or through jailbreaking. Most data plans on Rogers reset your US roaming cost to $3/MB from the $30/MB if your phone has no Canadian data plan. When in the US I use a similar method to BC_Doc. I use AT&T with the $100/year 10 cent/minute plan for voice, and can add $25/500MB or $10/100MB Data to that SIM chip. I’ve gotten it to work with an unlocked iphone with a little work. The only downside to this is that you’re not using your usual cell number. I’ve just been informed that this $50 unlock does include iphones. I am surprised. You can get most phones unlocked. You need a different SIM card to get it done but it is certainly worth the money and effort. When you travel, you just have to buy a SIM card for the country you are in. Has everyone forgotten about Calling Cards? If you have a landline, you can usually get a card to call home, or elsewhere at rates of your long distance plan. Of course, if you’ve given up a land line, this is not an option, but you could look at buying a prepaid long distance card. You can then call from your hotel room.